Vinca stem canker, Phoma exigua, is a fungal disease that is almost always prevalent during very rainy seasons. This fungal disease of periwinkle or ground myrtle causes shoot tips to become dark brown changing to nearly black as the disease progresses. 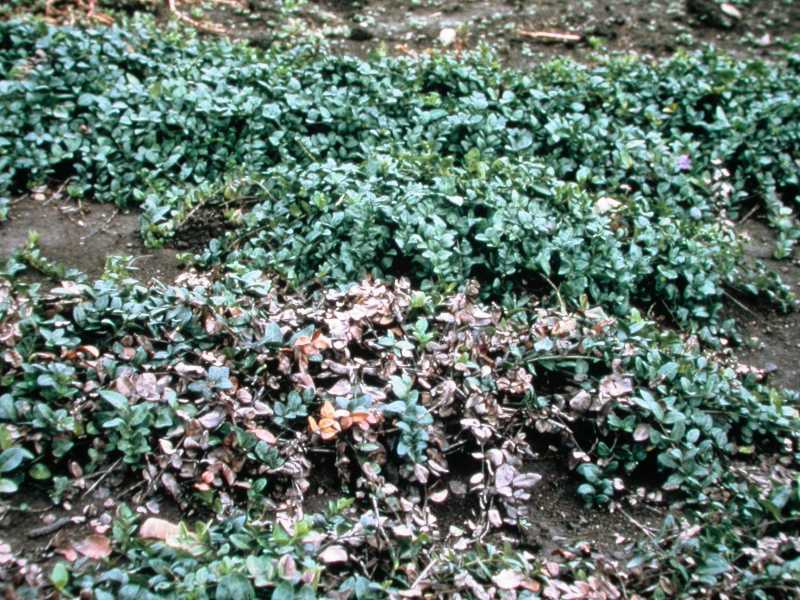 Stem canker (blight) may be so severe that attempts to maintain vinca plantings fail, and the plants have to be removed and replaced with other non-susceptible ground covers. Damage is most prevalent in cool wet weather in spring and in autumn when soil moisture is high. Newly planted beds, where plantings are thin and not well established, are very susceptible. Incidence of the disease tapers off during the hot dry weather of summer; however, in prolonged periods of cool wet weather, new infections can occur. Stem canker can also be a severe problem in nurseries where plants are grown under mist propagation. The fungus grows and persists indefinitely in moist soil and plant debris. It is not unusual for new plants to appear healthy when purchased only to become diseased when planted. The causal fungus survives in infested plant debris which is difficult to remove. Soon after new green shoots appear in spring, vinca stem canker, Phoma exigua, causes shoot tips to become dark brown, wilt, and die back to the soil surface. Some affected stems are nearly black. After several weeks, entire clumps of plants may wither and die. Small, black, dot-like, fruiting bodies develop on the surface of the diseased stem tissue. The sexual stage of this fungus is known as Diaporthe vincae. The spores are produced during very rainy seasons. The fungus grows saprophytically throughout moist soil and commonly colonizes dead and dying plant material. The fungus is believed to overwinter as dormant mycelium and as specksized, brown to black fruiting bodies (pycnidia) on the dead stems and leaves. The cycle of infection, disease development, symptom expression, and re-infection may be repeated as long as cool, damp conditions prevail and the soil moisture remains high. 1. Removal of debris. Remove infected plants and prune out diseased parts of the plant in the fall and spring. Discard this material but do not compost. Thin planting in the fall during dry weather to remove dense growth. 2. Purchase disease-free plants. For new beds, select and plant only vigorous, disease-free stock purchased from a reputable nursery. 3. Water. After transplanting, apply only enough water to maintain vigor. Avoid frequent watering if the soil is sufficiently moist for good growth. 4. Fungicides. Under conditions in the spring of extensive and frequent rainfall, fungicides can be applied to diseases beds every 7–10 days. Application should cover all leaves and stems to runoff. Thorough coverage is essential to be effective. Strategies 1, 2 and 3 are strictly organic approaches.